I hope everyone is having a nice relaxing weekend! I have a few of the plain satin titanium BrewDrivers done today. They are the same price as the blue ones yesterday, $70 plus shipping. I still have several dozen more BrewDrivers to finish up so there will still be more chances to pick one of these up this week. I'll be doing some more colors next. Plain ones are gone! Thanks you so much folks. OK, I have the first wave of BrewDrivers ready to do. I had thought I would do plain ones first but I decided to anodize these blue. I will have some plain unanodized ones tomorrow though. These are taking me a little while to finish because they have to be deburred by hand and it is quite time consuming to get into the nooks and crannies. So there will be several waves of these with a variety of finishes and colors. 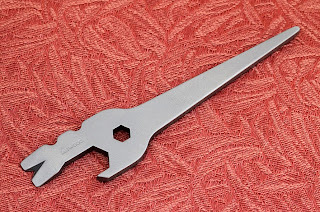 These titanium BrewDriver keyfob tools are $70 plus shipping. They will come with o-rings and a keyring. Blue Ones are gone, thanks! I'm still working on the new BrewDriver tools but they are very close to done. I should have the first ones finished by tomorrow. 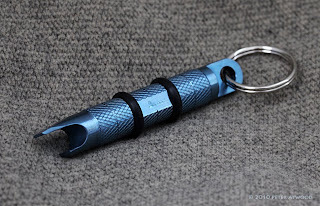 These are simple keyfob tools, turned from solid 1/2" bars of titanium and they measure 3.25" long. 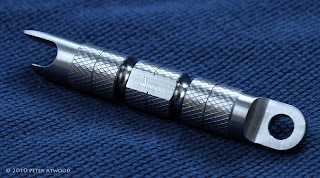 They feature a bottle opener and screwdriver/prytip on a diamond knurled shaft with a flat for my name stamp. The bottle opener is a two pry popper meaning it takes two shots to get the cap off but it does work fine. The screwdriver tip is the standard 1/4 wide size. A large lug style end with 1/4" hole makes getting the tool on and off the keys a very simple proposition. I will be doing the first wave as plain pieces, no anodized colors. They look pretty cool both with and without the o-ring bumpers so I will include the o-rings and let users decide if they want them on the tool or not. I'll send out emails in a few minutes. Meanwhile I don't know if paypal is still down or not but hopefully it will be back soon. 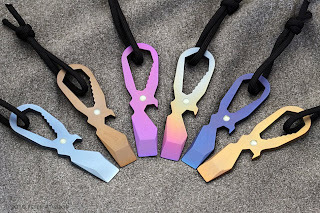 OK, I have six Titanium Atwrenches with glow dots available. As you can see from the picture they are all different. Price on them will be $75 plus shipping. One entry per person please! Read the rules below if you are unfamiliar with how these sales work. The Sign Up Sale will be over at 8PM Eastern time tonight, Thursday, January 21st. Drawing will be shortly afterwards and the winners may choose which color they want in the order that I receive payment or email response. Sale is Over, thanks to all who signed up. I managed to finish a few more Atwood Business Cards, all with stamps on them. 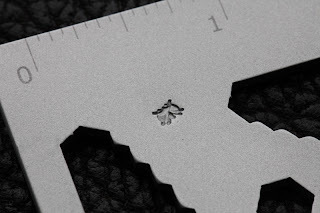 I have a variety of images including crowns, sword hilts, tiny boat, leaves, owl and many others, mostly different. To keep it simple, I will send you whatever I send you, no choice, as they are all nice. This is only a small batch so I will make it one per customer please. This is the end of the tools that are salvageable from the entire batch. They are $50 plus shipping and the link is below. I'm working on a bunch of new stuff for 2010. I just finalized some drawings for a new Pry Bar type of tool which will be done in both steel and titanium. The CandyBars will be cut next week. I have an updated Superbug coming as well and I'm thinking of doing that one in titanium only. They are pretty big compared to the first ones... 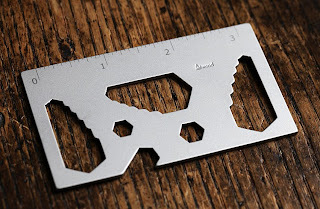 There are some other variation pieces in the works as well as a small titanium pendant tool. 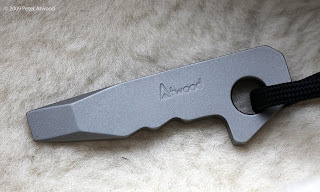 I first mentioned in the comments last week that I'm working on a new tool turned from titanium bar stock called the BrewDriver. The BrewDriver tool is very close to starting actual production. I should have some completed samples in a couple of days and some pieces for sale in about one week if all goes as intended. I'm trying to get a very large batch of these produced. I don't know yet how much they will be as I do not have the final cost yet myself. What I have seen so far of the knurling, grooving, milling and quality of finish has me pretty excited though and I think this will be a really neat piece when they are finally done. The complexity of these things is crazy sometimes. However, I can envision several spin offs coming from this one if we can get all the turning and milling figured out so I'm hoping it's all doable. 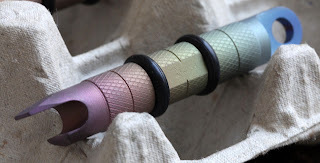 I intend to get those long promised SAE WingNuts started through the finishing process by next week. They are close, just need a little more sanding and clean up. I also need to get to work on some long overdue sheaths for a few dozen Fixer knives that I still have in stock from last year. I have a few 3V steel MicroSpud Wrenches available. I made these last spring and had set some aside thinking I would send them to get DLC coating but then completely forgot about them. I came across them this past weekend while cleaning up the shop. These have a bead blasted finish. Features include 7/16 wrench, bottle opener, prytip with wire stripper notch, 1/4" hex driver opening and alignment tool end, 5 inches OAL. The MicroSpuds are $70 plus shipping and the purchase link is below. While sorting through some stuff in the shop yesterday I found a dozen basic Mini Keytons. These will be one per customer and are $45 plus shipping. Thanks for stopping by. Well, tax stuff and paperwork is taken care of and now I'm back on track finishing some projects and getting others underway. This has been a highly productive couple of weeks and I have come up with a lot of new designs and some new ideas for the next few months. First up this year will be the Business Cards. You'll recall that I had a lot of trouble with these and even after getting them "fixed" there was still a high loss rate. I will only be able to save about 1/4-1/3 of the batch and even the ones that I am able to save are not necessarily perfect. 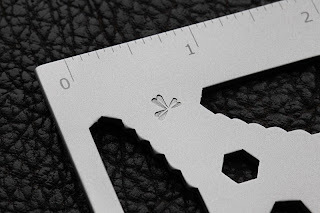 So, if you are looking for absolute precision then you should pass on this one because even though most of these tools are acceptable there are some that are a little bit off as far as the rulers are concerned. 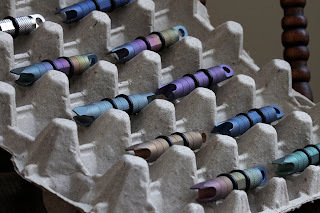 I can tell you one thing: I will not be making any ruler tools again for the foreseeable future unless I'm able to find an outfit that is more on the ball! 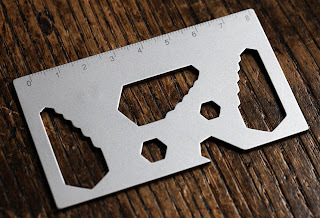 The Atwood Business Card combines 21 wrench functions in a single wallet sized 420 stainless steel card tool. Features include six SAE sizes: 1/4, 5/16, 3/8, 7/16, 1/2, 9/16. 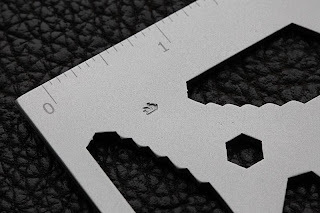 Metric sizes include 6, 8, 10, 12, 14 and 16mm in the center set and 5, 7, 9, 11, 13 and 15mm in the righthand set. 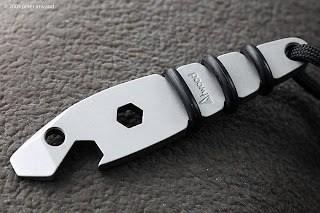 1/4 and 5/16 nut driver openings and 5/16 bottle opener are included. Two rulers complete the package. These are all bead blasted. All gone for now but a few more coming in the next day or so. Thank you!